Two-ply facial tissues come in a decorative box. Soft, quality tissues at a value price. Made from 65 percent minimum recycled fiber. INNER PACKAGING: 1 Box. 100 Tissues Per Box. 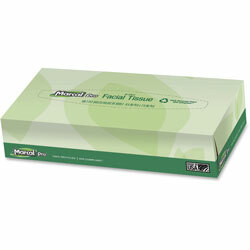 White Facial Tissue from Marcal! 66923 In Stock today. I ordered this because of the low price and you get what you pay for. These are by far the roughest facial tissues I have ever placed upon my face. Of course everyone has their preference, but for use in a preschool this product is not an option.